The Safe Drinking Water Act protects drinking water by stopping contaminants from entering the water and empowers communities to take action to prevent threats from becoming significant. (c) interference with the normal operation of the system. 2002, c. 32, s. 20 (1)…. On January 1, 2013, section 19 of the Safe Drinking Water Act came into effect. Section 19 requires municipal councillors and staff to “act honestly, competently and with integrity, with a view to ensuring the protection and safety” of drinking water users. the municipal drinking water system. 2002, c. 32, s. 19 (1). 1. The owner of the municipal drinking water system. 2. If the municipal drinking-water system is owned by a corporation other than a municipality, every officer and director of the corporation. 3. If the system is owned by a municipality, every person who, on behalf of the municipality, oversees the accredited operating authority of the system or exercises decision-making authority over the system. 2002, c. 32, s. 19 (2). (3) Every person under a duty described in subsection (1) who fails to carry out that duty is guilty of an offence. 2002, c. 32, s. 19 (3). (4) A person may be convicted of an offence under this section in respect of a municipal drinking-water system whether or not the owner of the system is prosecuted or convicted. 2002, c. 32, s. 19 (4). (5) A person shall not be considered to have failed to carry out a duty described in subsection (1) in any circumstance in which the person relies in good faith on a report of an engineer, lawyer, accountant or other person whose professional qualifications lend credibility to the report. 2002, c. 32, s. 19 (5). Note: A proclamation has been issued naming January 1, 2013 as the day on which s.19 of this Act comes into force. For a copy of the Safe Drinking Water Act, 2002 and its related regulations, go to the Ontario e- laws website at www.e-laws.gov.on.ca. The Safe Drinking Water Act (of Ontario) states that all water systems must meet licensing requirements. The license requires that chemicals used meet the National Sanitation Foundation Standard 60. This standard provides criteria to conduct a toxicological risk assessment (it must be tested for SAFETY!). “The NSF 60 standard requires that the chemicals added to drinking water, as well as any impurities in the chemicals, be supported by toxicological evaluation.“ Stan Hazan, General Manager, Drinking Water Additives Certification Program, NSF “A toxicology evaluation of test results is required to determine if any contaminant concentrations have the potential to cause adverse human health effects” NSF Fact Sheet 2008. NSF 60 is recognized as authoritative in Canada. To certify materials to be safe,it must conduct twenty toxicological studies referred to in the NSF 60 regulation book. NSF has not done those twenty toxicological studies. NSF administrator Stan Hazan has admitted this under oath in a California deposition. NSF admits that instead it just relies on EPA’s maximum contaminant levels (MCLs) for fluoridation materials and the contaminants therein, and as long as the concentration of each contaminant is below the EPA action level. Stan Hazan said the same thing in a 2000 letter to Congress. NSF does not take into account the symbiotic effect of so many different contaminants. In a recent freedom of information act request from someone in Edmonton Health Canada admits, they can supply no evidence that fluoridation is safe or effective. Clearly this reveals that the water fluoridation chemical hydrofluorosilicic acid, has never passed any toxicology testing as mandated under the Safe Drinking Water Act, therefore making the water fluoridation process illegal using the chemical hydrofluorosilicic acid. 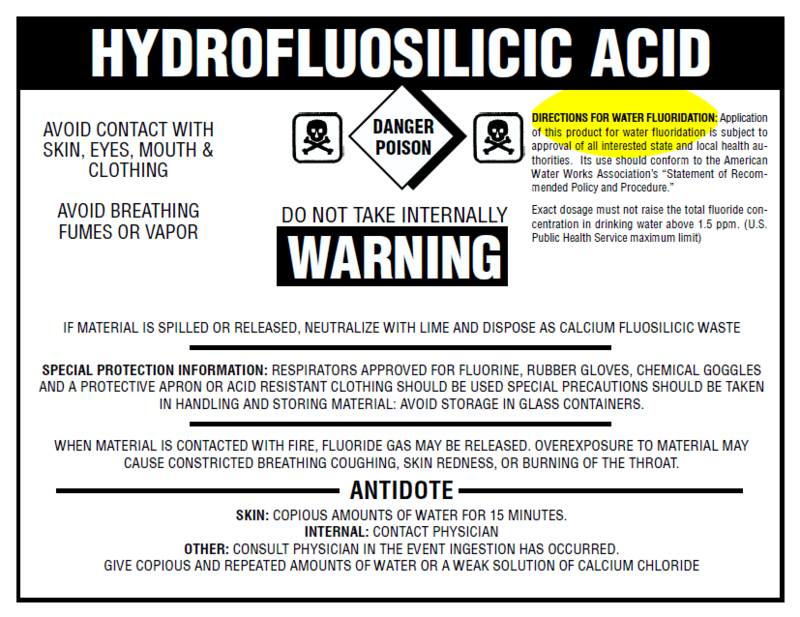 With this document from Health Canada admitting that they have no safety studies on hydrofluosilicic acid, fluoridation should be stopped immediately. NSF/ANSI Standard 60: Drinking Water Treatment Chemicals – Health Effects requires a toxicology review of the product to ensure its safety at the maximum use level and to evaluate potential contaminants in the product, but they do not have any toxicology reviews of this fluoridating agent either. Fluoridation is a clear violation of medical ethics, informed consent, and human rights. These reasons alone should have never allowed fluoridation to start in the first place. In this freedom of information request Health Canada also admits they have no documentation showing that they even considered human rights and medical ethics when allowing our water to be fluoridated…..
– “class one hazardous waste” by US Environmental Protection Agency. The EPA also lists it as a neurotoxin (brain damaging). NSF has reported that various tanker loads of so-called fluorosilicic acid have contained and therefore can be expected to contain the following elements and compounds: fluorosilicic acid, fluoride ion, hydrogen fluoride, lead, arsenic, mercury, cadmium, chromium, copper, thallium, selenium, and barium. NSF admitted in 2008 that some tanker loads emit beta radiation. That’s what you are swallowing with every glass of water that you drink. Is this really a healthy drink? I don’t think so! Previous Post What’s in the Water?